Extra-long stock rebar is perfect for long runs, as it can reduce the number of splices needed, which in turn reduces the overall weight of the construction and the amount of labor required. For those with in-house or on-site fabrication capabilities, it can also be an easy way to save money on a project. For any construction application that could benefit from extra-long rebar, PJ's Rebar offers 40-0 and 60-0 stock rebar. We carry 40-0 stock rebar and 60-0 stock rebar in various sizes/gauges to meet the unique needs of your project. We can supply any quantities you require, and have the rebar delivered directly to your facility or jobsite. We also offer domestic and import stock rebar in 20-0 and 30-0 lengths. 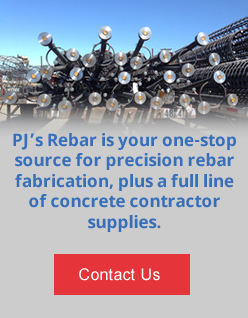 PJ's Rebar has the 40-0 and 60-0 stock rebar you need. Request a price quote today, or contact us for more information.